Manufacturer of a wide range of products which include pv spd and solar pv 600v dc surge arrester. Because PV installations must be designed to provide full exposure to the sunlight, they are highly vulnerable to the effects of lightning. The capacity of a PV array is directly related to its exposed surface area, so the potential impact of lightning events increases with system size. Where lighting occurrences are frequent, unprotected PV systems can suffer repeated and significant damage to key components. This results in substantial repair and replacement costs, system downtime and the loss of revenue. Properly designed, specified and installed surge protection devices (SPDs) minimize the potential impact of lightning events when used in conjunction with engineered lightning protection systems. A lightning protection system that incorporates basic elements such as air terminals, proper down conductors, equipotential bonding for all current-carrying components and proper grounding principles provides a canopy of protection against direct strikes. If there is any concern of lightning risk at your PV site, I highly recommend hiring a professional electrical engineer with expertise in this field to provide a risk assessment study and a protection system design if necessary. It is important to understand the difference between lightning protection systems and SPDs. A lightning protection system’s purpose is to channel a direct lightning strike through substantial current-carrying conductors to earth, thus saving structures and equipment from being in the path of that discharge or being directly struck. SPDs are applied to electrical systems to provide a discharge path to earth to save those systems’ components from being exposed to the high-voltage transients caused by the direct or indirect effects of lightning or power system anomalies. Even with an external lightning protection system in place, without SPDs, the effects of lightning can still cause major damage to components. For the purposes of this article, I assume that some form of lightning protection is in place and examine the types, function and benefits of the additional use of appropriate SPDs. In conjunction with a properly engineered lightning protection system, the use of SPDs at key system locations protects major components such as inverters, modules, equipment in combiner boxes, and measurement, control and communications systems. Aside from the consequences of direct lightning strikes to the arrays, interconnecting power cabling is very susceptible to electromagnetically induced transients. Transients directly or indirectly caused by lightning, as well as transients generated by utility-switching functions, expose electrical and electronic equipment to very high overvoltages of very short duration (tens to hundreds of microseconds). Exposure to these transient voltages may cause a catastrophic component failure that may be noticeable by mechanical damage and carbon tracking or be unnoticeable but still cause an equipment or system failure. Long-term exposure to lower-magnitude transients deteriorates dielectric and insulation material in PV system equipment until there is a final breakdown. In addition, voltage transients may appear on measurement, control and communication circuits. These transients may appear to be erroneous signals or information, causing equipment to malfunction or shut down. The strategic placement of SPDs mitigates these issues because they function as shorting or clamping devices. 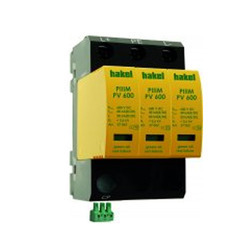 PIIIM PV is surge arrester type 2 according to EN 61643-11. 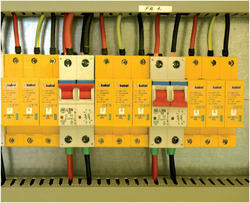 Complete device consists of a base part and pluggable modules. These arresters are recommended for use in the Lightning Protection Zones Concept at the boundaries of LPZ 1-2 (according to IEC 1312-1 and EN 62305) for equipotential bonding of positive and negative busbars of photovoltaic systems and elimination of transient overvoltage that originate during atmospheric discharges or switching processes. Failure indication of these disconnectors is partly visual (discoloration of the signal field) and partly remote monitoring by potential free switching contacts (only PIIIM PV* DS type).